Spinning on the turntable this week in the "rock room" is the somewhat obscure 1977 LP release "Rough Mix" by Pete Townsend and Ronnie Lane. A perfect little album well known among fans and friends, not so much in mainstream rock circles. This LP also features many of the duo's musician friends such as Eric Clapton, Charlie Watts, and Ian Stewart contributing to the collaboration. 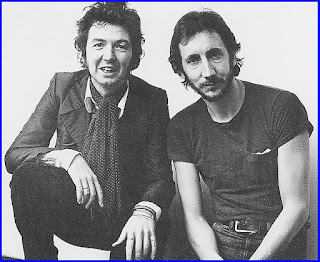 What started out as a Ronnie Lane solo excursion with Townshend acting as producer, became a special joint effort and magnificent collection of songs.The inside of the LP reads "Ron and Pete play various acoustic and electric guitars, mandolins and bass guitars, banjos, ukeleles and very involved mind games". Both musicians were suspended in air at this point in their careers; Lane, post-Faces blowing through money with not enough hits, and Townshend in constant flux, undecided about the Who and battling demons. Shortly after the completion of this record Townshend would return to The Who, and Lane, would commence his long battle with multiple sclerosis. The LP is a sometimes forgotten segment in both musicians long and varied careers, and it should not be. Track by track its strengths outweigh its weaknesses, and its has aged very well. "Mix One" of the LP opens with the strident and hopelessly catchy "My Baby Gives It Away" with Townshend taking on the vocal duties. Supported by slashing shimmery acoustic guitar strums and a bopping picked guitar lick, the song is fitting opener and a strong Townshend composition. The rich sounding edge of the slightly disco drums race toward the fine woman who gives it up "totally free". The Glyn Johns production is tasteful and timeless, and in no way dates from the album. Following the opener comes Lane's first contribution to the LP and one of my personal favorites, "Nowhere To Run". When the song opens a warm autumn breeze smelling of burning leaves, full moons, and harvest time settles over the morning. Lane's parchment tinged vocals sound world weary but reassuring. A methodical banjo line quietly rises into the mix like a child's balloon reaching for the sun. A whistling organ swells with the gently rolling rhythm of the song. Even with Lane's gentle warning that there's "nowhere to run" the song continues to breathe optimism. A true collaboration, the title track and instrumental "Rough Mix" soars out of the grooves like a classic Who number, then with a heavy funk, breaks down in the middle similar to a classic early Faces tune. An unmistakable Ronnie "Plonk" Lane bass line reinforces the track, in conjunction with big "windmill" moments and percussive punctuations. This instrumental showcases the musical strengths of both the album's collaborators. "Annie" tip toes in next, a joint writing effort between Eric Clapton, Lane's wife Kate Lambert, and Ronnie. The track is delicate and blue sky clear ballad, with the chorus having the fingerprints on "Slowhand" showing on the glass. A simple song with a wholesome content, dealing with a uncertain future and wishing for protection for your treasured ones. Lane is one rock songwriter whose lyrics are often concise and straight forward, yet always emotionally stirring, without being coy. A melodic treasure and in my opinion a highly undervalued song, "Annie" revels itself on this LP like a garage sale bargain, or a small golden token exposed by the wind on a vast white beach of sand. Townshend's "Keep Me Turning" follows and keeps the run of melodically appealing and instrumentally interesting songs going. Pete's friend and Who member/helper Rabbit adds a touch of omnipotence to the song with some stained glass church organ flourishes. The content of the song is a familiar topic of Townshend's, being the contrast between the world of celebrity and a solitary artist life. The narrator is begging for the help of a mystical lady or even from God. Mix One ends a reeling and rocking with the Ronnie Lane led "Catmelody". 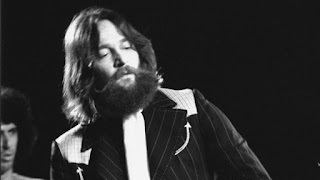 A straight barn burner with no chaser, "Catmelody" burns with a flourish directed by the "fifth Rolling Stone" Ian Stewart's honky tonk tickling of the ivories. Nothing too deep awe or inspiring here, just a cooking rock and roll groove and a fitting closer to side one of the album. Mix Two starts with the quirky Townshend number, "Misunderstood" featuring a unique bouncy groove driven by a harmonica riff and some bubbly percussion. The mysterious Bijou Drains is featured as playing the "gulp". For those in the know, the moniker Bijou Drains is AKA Pete Townshend who used the alias while producing the Thunderclap Newman LP. The track takes on the personality of one of Townshend's home demo recordings, which is not a bad thing, as many of his demos surpass the finished products. A quirky tune, with a lot to offer when looked at in detail. Similarly to "Nowhere to Run", the next song "April Fool" is one of the finest Ronnie Lane tracks he ever penned. Spotlighting Eric Clapton on Dobro and foot taps, the song takes flight with Lane's emotive opening verses. Clapton slips in like a late night visitor during the second verse with tasteful and tender slide guitar lines. During Clapton's solo, which continues until the song ends, large deep double basses growl in fantastic deep shades contrasting Clapton's virtuous licks. I feel like I am in a dusty wood paneled antique store, and with every isle I travel down, and with corner I turn there is a Ronnie Lane song under glass. Preserved like a delicate flower, collecting dust, but ready and willing for discovery for those who search. 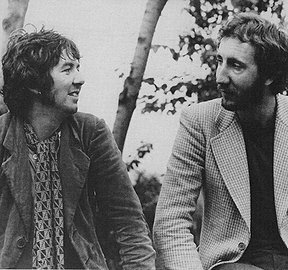 The third track on "Mix Two" of the LP is the Townshend composition "Street In The City", a "Day In the Life" like observation song. Starting with a crystal clear Townsend acoustic guitar filigree that sparkles like a clear mountain stream, the moving orchestrated backdrop shifts beneath the melody line, encouraging the song to blossom. Scored by Townshend's father in law Edwin Astley the song is the most mature on the LP, meaning the most lyrical and musical complex. The song is all about the orchestration and its relationship with the acoustic melody lines, working in conjunction with the sung melody lines. A really nice piece of work tucked away on Mix Two of the LP. "Heart to Hang On To" is the next to last song on the album, and is unique for the shared alternating vocals by Lane and Townshend. A slower track balanced on the edge of ballad, which patiently gains momentum over the course of the song. The instrumentation is somewhat sparse, with the song containing alot of 'air and space". A song of longing, the number benefits from the addition of Who bass player John Entwistle's brass. Worth the price of admission alone for the dual vocals and picturesque lyrics. The closing number is a breezy country lilt "Til the Rivers All Run Dry" sung gently by Townshend. A slow number with a gospel vibe, that for me contains shades of Delaney and Bonnie. Again, Clapton and his Dobro make an impressive appearance. The song feels like a paean to Meher Baba, and is probably just that, with Pete and Ronnie both dedicated followers of the holy man. The song, like much of the aforementioned tracks contains a wishfulness, and a longing that can only be remedied by spiritual or loving support. A fine closing to a diverse and musically satisfying LP. Pete Townshend and Ronnie Lane's "Rough Mix" is an album often covered by the sands of time, and when the breeze blows right, it is revealed in all of its glory. What is displays are two class act musicians caught in a time of uncertainty and change. Townshend's support of his comrade Lane is beautifully portrayed through his additions to Lane's songs as well as his personal expressions through his own composed numbers. Despite the production methods of the era it was created, the LP remains fresh, relevant, and sounds great off of the original vinyl. There are more than enough unique goose bump moments to keep any fan of either man interested and excited. There is now available a remastered version of the album on CD with bonus tracks, but as previously stated, for this review I listened to the original LP release, so did not listen to those included bonus tracks. As an addendum to this review, recently a bootleg under the title "Unsurpassed Masters"-Rough Mix started to circulate around the web. This recording is purportedly from the original 10" multitrack reels, pressed direct to silver CD. It sounds absolutely amazing, and contains instrumental versions of many "Rough mix" songs as well as two tracks not contained on the album. Using the official release in conjunction with the bootleg will give the fan an all encompassing and definitive view of this record. Great review of a great album. It ranks as a favourite for when things don't go as good as they should, specially concerning family. Lane's voice feels somewhat like stepping on your favourite cardigan, falling asleep and waking up to the surprise of having the one who loves you embracing you. Thanks for sharing, pardon my engligh. Federico, Mar del Plata, Argentina. Thank you for reading and for the comments. I agree, a very comforting record featuring the best that Pete and Ronnie have to offer. An all time great.